and brains in the right column to normal-weight people. ﻿New research reveals how obesity is associated with altered functioning of brain's opioid system, which is intimately involved in generating pleasurable sensations. Researchers found that obesity was associated with significantly lowered number of opioid receptors in the brain. However, no changes were observed in the dopamine neurotransmitter system, which regulates motivational aspects of eating. The research was published in the Journal of Neuroscience. Obesity is a great challenge to human health worldwide because it is associated with serious medical conditions such as type 2 diabetes, coronary heart disease, and stroke. Even though it is well known that unhealthy eating habits are the major cause for obesity, people have often problems with restraining their eating. 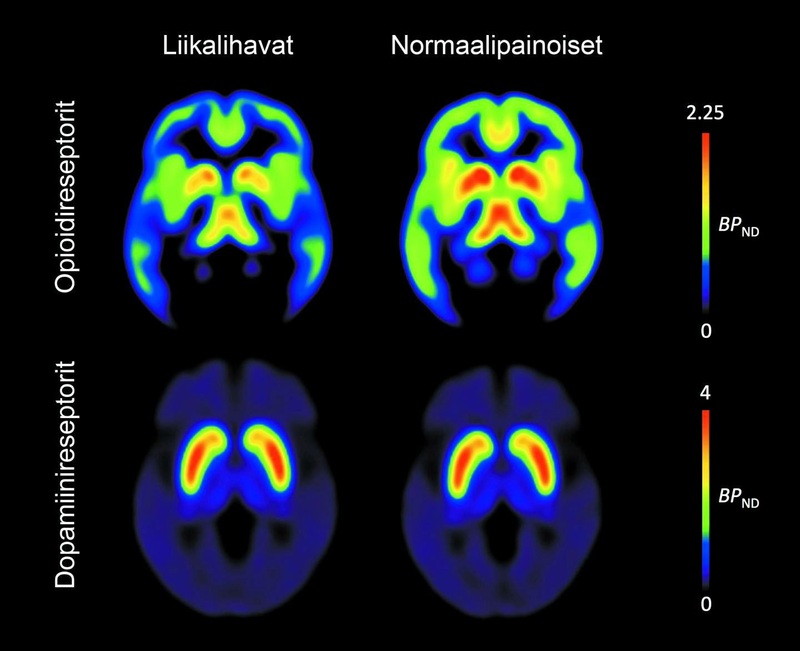 The findings highlight how obesity is associated with brain-level molecular changes. It is possible that the lack of brain's opioid receptors predisposes the obese individuals to overeating to compensate decreased hedonic responses in this system, the researchers said. The findings have major implications for the understanding of the causes of obesity. They help us to understand the mechanisms involved in overeating, and provide new insight into behavioural and pharmacological treatment and prevention of obesity. However, we do not yet know whether the altered brain neurochemistry is a cause or consequence of obesity. Based on material originally posted by Aalto University.